Steve Albini’s dream sound trigger-able from your e-kit? Plug in, baby! This is a must for fans (and there are many) of Albini’s iconic drum sound. At this price, very few. Steve Albini is one of the most interesting technical personalities of the past 30 years. Best-known as an engineer on classic albums from Nirvana, the Pixies, PJ Harvey, Neurosis and hundreds of others, Albini shuns the term ‘producer’ in relation to his role. Operating sessions from his Electrical Audio studio in Chicago, Albini refuses to adopt digital systems personally (although his studio is set up to record digitally too), deeming them fragile compared to the permanence standard of tape. 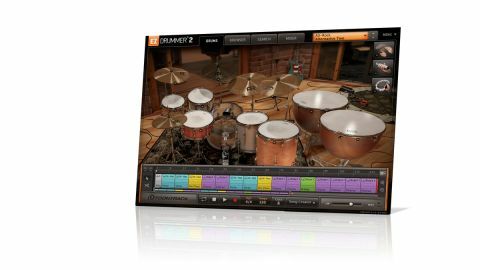 The Alt-Rock pack is an add-on for Toontrack’s popular EZ Drummer software, so you will need the host program in order to use the sounds. Once loaded, there are two full kits waiting for you, all fully customisable, and pre-arranged into nine different presets to get you started. The kits are essentially a DW Collectors, tuned for big, open rock sounds, and a Ludwig Club Date, whose toms are tuned higher for a more melodic sound. There are also some add-on tom sounds courtesy of a Gretsch USA Custom for both sounds, and an additional 16"x16" floor tom from a Ludwig Hollywood to match the higher tuning. On top of all of this, Albini has recorded 26" and 29" timpani, a 27" Slingerland Radio King bass drum, LP cosmic percussion and a muted Paiste Giant Beat hi-hat bottom as cowbell sounds. Then there’s the 15-strong collection of cymbals from Paiste, Bosphorus, Istanbul and Meinl. Phew! We were, of course, eager to get stuck into the big rock sounds on offer here - and Steve has supplied them in spades. Most notable are the samples of a damped 1920s Ludwig nickel-over-brass 14"x5" snare. From the first hit, it’s the elusive Grohl sound from Nirvana’s In Utero: fat, dead, but still punchy. Meanwhile, the undamped version of the same snare, plus a Tama Starclassic Maple give a more open, lively version of a big alternative rock snare drum sound. As with most Toontrack packs, the mixer gives you the option to tweak the overhead and ambient mic levels. Albini’s are distinctive, with a recognisable - almost slapback - effect, and we’re glad to report that Toontrack Alt-Rock makes this part of his sound achievable too. The ‘melodic’ kit and huge bass drum are great for more contemporary indie-style rock, although the timpani may be more of an occasional use. The fact that this pack exists, and is available to trigger from your e-kit for under £50, makes it nearly impossible to fault. An hour in the studio with any engineer will set you back considerably more. This is a must for fans (and there are many) of Albini’s iconic drum sound.